The expression “as American as apple pie” gets bandied about a lot, without much thought to whether apple pie is American at all. So, is it? It turns out that the answer to that question is complex, as it should be if it’s to be a symbol of America. The concept of a pie, food baked within a crust, dates back to the early Egyptian times (6500 BC). 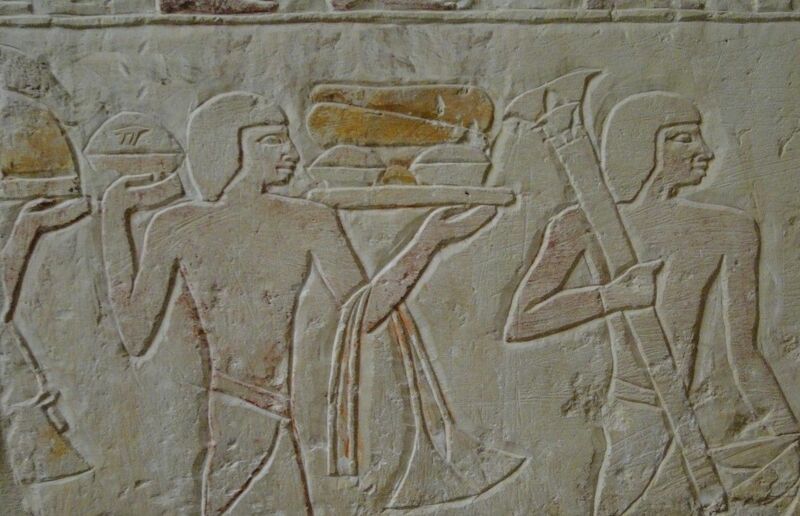 By the time of Pharaoh Ramses II (1304 to 1237 BC), pies were filled with fruits, nuts, and honey, and must have been pretty popular, as they are painted on the walls of his tomb. The Greeks and Romans improved pie technology, developing what we would consider a proper crust. In the Middle Ages, pies were a staple of the European diet, usually filled with meat. The pies, called “coffins” were tall and straight-sided and the crust was made thick and hard to withstand baking. Whether the crust was actually eaten, or merely served as its own pan, is some matter of debate, apparently. 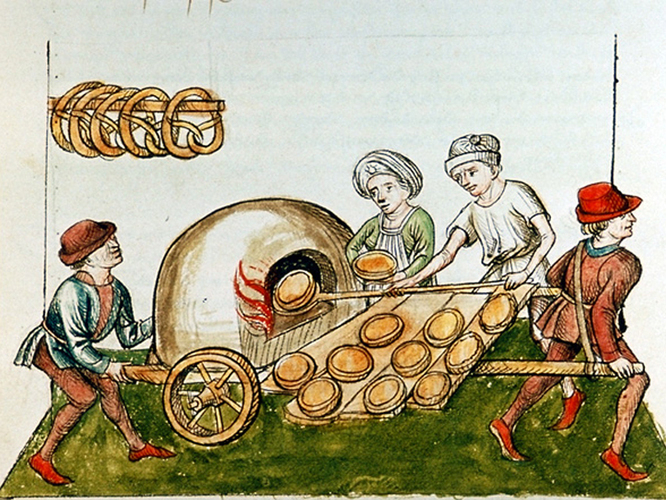 A drawing of a medieval pie baker, circa 1465-1475. He’s apparently the forerunner of food trucks as well with that mobile oven. By the time the Pilgrims arrived in America, pies had started to resemble what we imagine a pie to be—shallow and round. There’s a story that round pies came about so that early American bakers could literally cut corners to save on precious ingredients. Fruit pies started to be seen as well, although the Pilgrims had to be shown which New England fruits and berries were edible by the native Americans. American? : A bit but not much. You can’t make apple pies without apples, so how American are apples? It turns out that the only apples that are native to the New World are crabapples. And while you can make a nice tart pie out of crabapples, that’s not what we’re going for here. The progenitor of the apple (genus: Malus) arose in eastern Turkey, but has been grown in Europe for millennia, and were likely the most commonly eaten fruit. So important were they that the early colonists brought apple seeds to the New World, and the first apple orchard was planted in 1625 by William Blaxton, the first settler of Boston (his farmland would later become Boston Common). There’s also the legend of Johnny Appleseed spreading apples on the American frontier. The truth is that rather than strewing apple seeds willy-nilly, he (real name: John Chapman) planted and tended to apple nurseries throughout Pennsylvania and Ohio in early 1800s. True cinnamon from Sri Lanka on the left, Indonesian cinnamon (cassia) on the right. The main spice in apple pies is cinnamon. That we poor commoners are able to sprinkle it liberally into our pastries is the end result of a tale that spans millennia. 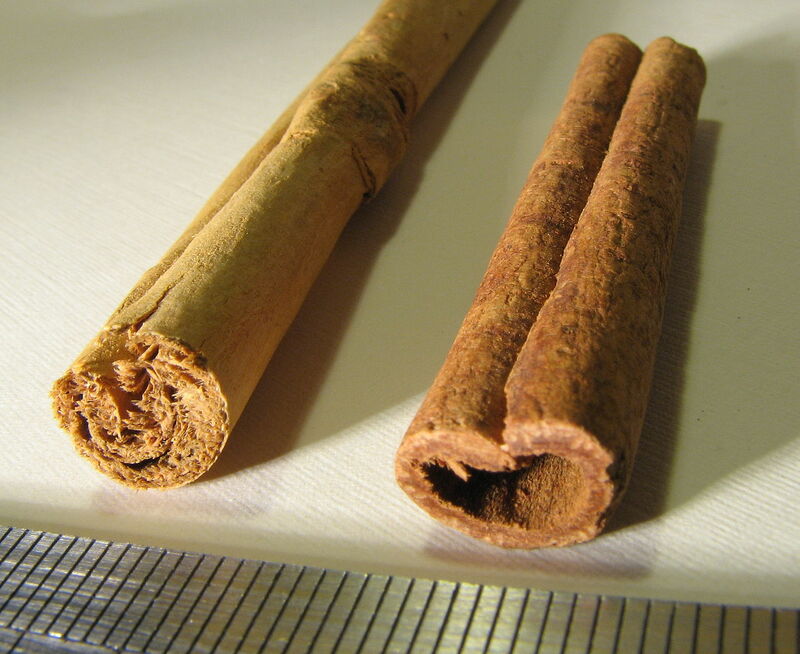 In short, cinnamon is native to Sri Lanka, Bangladesh, India and Burma. It was imported to Egypt as early as 2000 BC and is mentioned in the Bible. At one point, cinnamon was so precious it was only offered to gods and gifted to kings. Arab traders had the monopoly on trade throughout the Mediterranean. While it was known in Europe as early as the Middle Ages, its exact source was a secret the traders kept to themselves. The dearth of knowledge led to some pretty imaginative legends about cinnamon’s source (dredged up from the source of the Nile, collected by giant birds, etc.). The Arabs sold the spice to Venetian traders who held the European monopoly on the spire trade. That is, until Portuguese explorers stumbled upon Sri Lanka and took over control of the cinnamon trade. (Columbus apparently thought he had discovered cinnamon in the New World and proudly sent a sample to Queen Isabella. Unfortunately, Columbus was a poor botanist.) Eventually the Portuguese were ousted by the Dutch, who then lost Sri Lanka to the British East India Company. By then, however, cinnamon had been transplanted to many places around the globe and the monopoly was broken. Nutmeg is the other signature spice in apple pie. Like cinnamon, it was one of the mystical spices that Europe couldn’t get enough of during the Middle Ages. 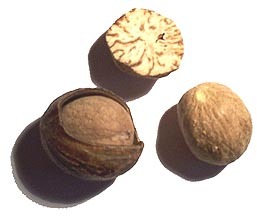 Nutmeg is native to only one island, Banda, in Indonesia. Arabs traded it to Venetians who then sold it at exorbitant prices to the rest of Europe. However, in 1511, Malacca, a trading center in the East Indies, was conquered by Alfonso de Albuquerque, a Portuguese general. Learning of the previously secret location of Banda, he sent off three ships to find it. They returned to Portugal stuffed to the gills with nutmeg. The Dutch eventually took over the nutmeg monopoly, although they were always challenged by the British, resulting in a series of sporadic wars that lasted over a century. At the conclusion of the Second Anglo-Dutch War, when Britain was bankrupt and sooty—the Great Fire of London had just occurred—Britain offered to cede back to Holland the American colony of New Netherland and its largest city New Amsterdam, which it had captured the previous year. The Dutch refused, preferring that the British give up the East Indian islands. Thus, the Dutch deemed the spice trade more valuable than New York City. Eventually, during the Napoleonic Wars, Britain temporary gained control of the Spice Islands and quickly transplanted nutmeg trees throughout the empire. Tak gode Applys and gode Spryeis and Figys and reyfons and Perys and wan they are wel ybrayed co-lourd wyth Safron wel and do yt in a cofyn and do yt forth to bake well. To make pyes of grene apples – Take your apples and pare them cleane and core them as ye wyll a Quince, then make youre coffyn after this maner, take a lyttle fayre water and half a dyche of butter and a little Saffron, and sette all this upon a chafyng dyshe tyll it be hoate then temper your flower with this sayd licuor, and the whyte of two egges and also make your coffyn and ceason your apples with Sinemone,Gynger and Suger ynoughe. Then putte them into your coffin and laye halfe a dyshe of butter above them and so close your coffin, and so bake them. So what is American about apple pie? I argue that apple pie is the perfect example of America. 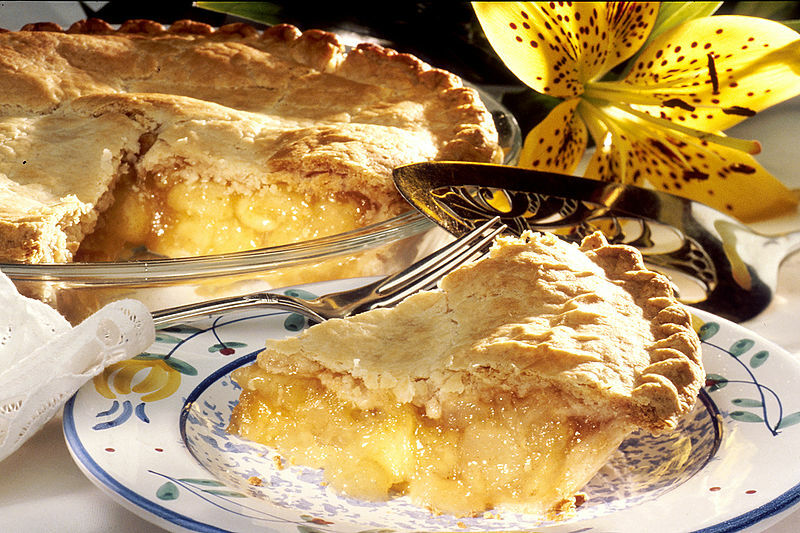 Apple pies did not spring fully formed onto the American landscape. The notion of apple pie traveled here from the Old World, and was modified and perfected according to the difficult circumstances into which it arrived. Its ingredients come from the world over, and have traveled circuitous paths to get here. It takes a bit of work to prepare and the result may not always come out perfectly, but is usually more than acceptable. This entry was posted in Uncategorized and tagged history by mjtierney1. Bookmark the permalink.